Soda bottles, empty cans, paint drums, didgeridoos crafted out of PVC pipes, and gongs made out of disposed steel sheets will greet you when you step into city-based percussionist Montry Manuela��s home. 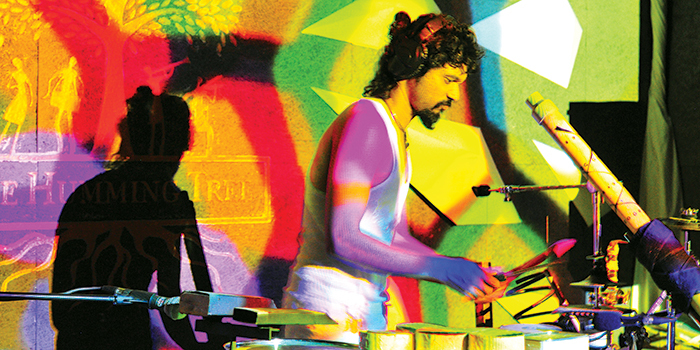 The former drummer for popular city band Swarathma, began his own experimental outfit, Thaalavattam in 2012. And as he tells us, a�?Thaalavattam is not a band, ita��s a project, anyone can join if they want to, artistes, musicians, dancers a�� all are welcome. The idea is to inspire one another and have fun and through the project promote an eco-friendly lifestyle using music while embracing the idea of a�?reuse, reduce and reclaima�� wholeheartedly.a�? We sat there mesmerised, as Manuel created a frenzy of sounds through his a�?reclaimed junka�� instruments. The sound was a mix of drum a�?na�� bass with a touch of a psychedelic vibe, often using more than one instrument at a time. a�?Each container sounds different from the other,a�? says Manuel. a�?This is something I will not be able to replicate. For example, an empty Asian Paints container sounds different from an empty Berger container,a�? he laughs. Manuel has worked in advertising companies like Mudra, and now channels his creativity into crafting instruments out of discarded materials. Thaalavattam as a project moves to a different beat that Manuel finds invigorating. a�?I have the freedom to do what I want, I can play for corporates, hold workshops on team building using drum circles or work with dancers, which is not possible with a band because there is more than one person involved and egos are at stake,a�? shares Manuel. He also tells us how people always respond positively when they see his novel instruments for the first time. a�?They always go a�?wowa��. And foreigners especially get quite excited since they are little more aware of the merits of reusing and recycling products,a�? he says, adding, a�?I remember playing a gig at Mount Carmel College; I gave the audience plastic bottles and about seven hundred girls went crazy.a�? Manuel is also part of awareness drives in the city a�� like the Indiranagar cleaning drive where he involved people from the neighbourhood to clean up a park recently. a�?I think drives like this are more effective than putting a green sticker on your car,a�? he tells us. He also believes that change can come about through children. a�?Catch them young and speak to them through music, they will respond easily to it,a�? he enthuses. When Manuel is not organising a show or touring the country, he draws inspiration from watching YouTube videos of Australian street performer Dub FX and Swiss experimental drummer Jojo Mayer, conducting team building classes for kids and designing clever bags, clocks and didgeridoos out of waste material.